By the year 2012, over 1 billion internet users will use social media sites, according to a recent report by eMarketer. Moreover, out of them, 75% will have access to broadband internet. It's no surprise! "Social media driven internet” follows the same cycle of market adoption for any new product or service, as in the marketing theory books. When first introduced, people feared of registering with social media sites, and exposing their personal information online. Lot of these people feared about the privacy of sensitive personal information. Only a handful of people wanted to test the waters. In theory, they are called the innovators. The geeks with low perceived risks of testing new things. Typically right brained. Yet, there was another segment of users who wanted to register with these sites, but didn’t want to reveal their identity. It resulted in another big debate on "Is anonymity good for the web or not?" However, today the user-generated internet is really taking off fast. People are willingly coming out and joining these sites without any fears. Still there are many concerns towards privacy issues, but the enthusiasm is higher than what it used to be in the beginning. We can clearly see that 2007 was a real exponential point for social media sites. It was truly the year of "Change agents". One year back, there were too many people arguing that social networks are just a fad, and web 2.0 is yet another catch word. But, we come to the end of 2007, as the year which marked the most significant changes in internet. Seven out of top ten websites on Alexa rankings were social media sites, during last 3 months. But, in 2006 search engines dominated this top 10 list, with very little room for social media sites. 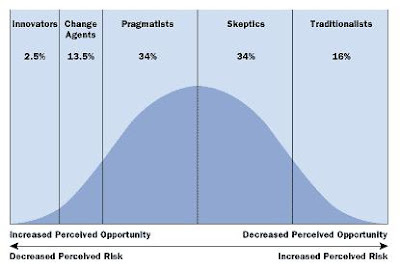 According to this eMarketer predictions, next 4 years going to be the years for the Pragmatists. And, then we'll reach a point where the sustainability becomes an issue! 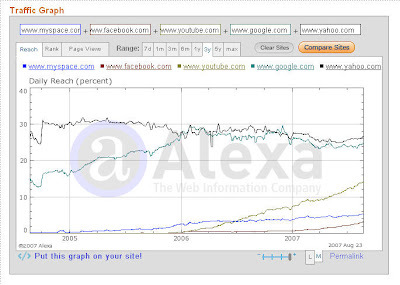 4 years ago, no one talked about web 2.0 or social media boom. Who knows what’s next in line, to replace these words?